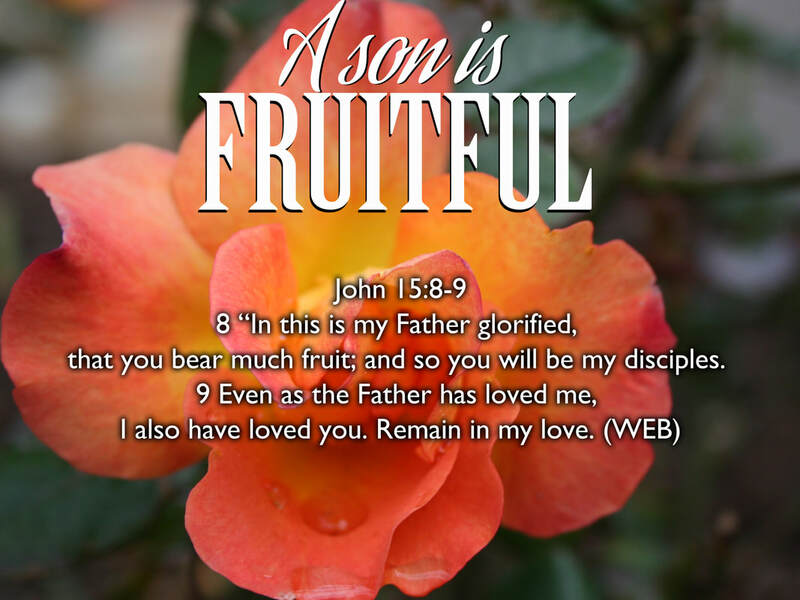 Jesus told us that the best way that sons can honor their Father is to bear lots of fruit. In this week’s Scripture passage, we read how our fruitfulness is directly related to bringing glory to our Heavenly Father. There has been lots of focus in church life on being fruitful over the years. In the parable of the sower and the seed in Matthew 13:1-9, Jesus tells us how the seed that falls on a good and noble heart bears thirty, sixty or even one hundred times the seed that was sown (verse 8). Jesus also speaks of fruitfulness in the parable of the talents in Luke 19:11-27 where the master honors his servants who double the money that he invested in them. Even in the original blessing that God spoke over Adam and Eve (Genesis 1:28), part of that blessing was to ‘be fruitful and multiply’. There should be no question in the heart of every believer that God delights when we bear much fruit. Jesus even told us that by our fruit people will know us (Matthew 7:16). Over the years, when I have thought of the fruit that brings glory to the Father, I have primarily focused on the fruit of my labors. The things that I do to share the message of the gospel with others. Of course the fruit of my labors would also include my personal devotions & my prayer life. Unfortunately in my early Christian life, these external measurements were the primary measuring stick that I used when I have thought about the fruit that would bring glory to my Heavenly Dad. Don't get me wrong, I still believe that our own personal expressions of God in us will produce tangible evidence of many good things. After all, James 2:18 does say that our faith in God should find expression in the things that we do. But here is a question for you... What happens when you are not able to bear this kind of ‘ministry’ fruit in your life? What happens if circumstances prevent you from doing ‘the stuff’ that we often associate with ministry fruitfulness? Are you any less loved then? Of course not! A few years ago, I felt the Lord speak to my heart from Psalm 46:10 which simply says ‘Be still and know that I am God’. I felt the Lord say that He wanted me to stop all my ministry activities and the things that I so easily identified with fruitfulness, ...and be still for a while. I quickly obeyed but to be honest, I thought this sabbatical would last for a month or two then I would get back to being productive. But when 12, 14 and 16 months went on and I was still in this position of 'being still', I began to see what God was trying to communicate with me. You see, the longer that my inactivity went on, the less valuable I felt I was to God because I thought I wasn’t bearing the kind of fruit that pleased Him. This blog is too short to share my story, but nevertheless, it was during this time that the Father revealed to me that He didn’t love me because I did anything to deserve it. He loved me simply because I breathed. It was at this time that I truly received a deeper revelation of the fruit that brings glory to our Heavenly Dad. While the signs and wonders are good too, there is a deeper, more lasting sign of fruitfulness that my Papa wanted to work in me. And that was the personal fruitfulness in my life that came from living a life in His love. These days, I love to read the same Scripture passage from The Passion Translation! In my opinion, this Bible version helps us to better understand that the fruit of the Spirit actually is rooted in love and finds many expressions of personal well being as a result. When I came to the place where I felt that I had no fruit (works of service) to offer up to God, the Lord pointed me to the fruit that He was after all along, and that was the personal fruitfulness of how I lived my life. I realized that when I lived in love myself, when I lived a joy-filled life myself, when I was at peace in my heart and mind, when I lived a patient life, when I was kind, when I was good to myself and others, when I lived a life of faith, when I was gentle, when I could live a life of temperance... All these things brought glory to my Dad! Before this extended time of sabbatical, I was still focusing on the ‘ministry stuff’ as the evidence of the fruit of the Holy Spirit in my life. But after this time of rest, I realized what my Father had been after all along in my life... and that was simply my own personal fruitfulness that came from abiding in His love. Those who struggle with an orphan mindset will see the fruit that God is looking for as something that they have to labor to earn in the harvest field. But a son who knows that He is loved no matter what he does, simply sees that the greatest evidence of a fruitful life is living exactly as Jesus continues to live... resting in His Father’s love. My prayer today is that we would all come into a deeper revelation of the love of God for us personally that would set us free from the need to perform or strive to justify our fruitfulness. May we all be able to see more clearly that our Father’s love for us is not conditional on anything we do to earn or deserve His affection. The good news of the gospel is simply that He loves us because He is the complete expression of love itself (1 John 4:16). I pray that we will all know more today than ever that the will of our Heavenly Father is that we would remain in the love that He has for us. After all, the Gardener’s greatest desire is that we would take up residence in His Son who is the true vine and simply live the easy life of being a branch connected to all that is good. When we begin to shift our focus from our works to the finished work of the cross, we will begin to see that our primary function is to simply receive from the vine and bear much fruit in the process. May the reality of the love of God cause each and every one of us to bear much, much fruit today...thirty, sixty or even one hundredfold more than we could ever hope for or imagine. All the while, living out of an overflowing cup (Psalm 23:5) of love, joy, peace, patience, kindness, goodness, faithfulness, gentleness, and self-control.